Share "Getting Wild Birds Ready for Winter"
Wild Birds are well equipped for changing seasons, not only by migrating south but also by getting heavier, warmer plumage, eating a winter-friendly diet, and gathering in groups to share the hard work of finding food and shelter when those resources are scarce. Backyard birders can help their feathered friends get ready for winter, however, with just a few simple steps. Offer Better Autumn Foods: Birds need more fat and calories in autumn. If they migrate, that food is fuel for their journeys, but even if they stay in the same area, the better energy source will help them generate plenty of body heat to survive falling temperatures. Sunflower seeds, suet, and nuts are some of the best foods to offer birds in autumn. Winterize Bird Feeders: It can be uncomfortable to refill feeders during a winter storm, so changing to larger capacity bird feeders is a good autumn step and ensures a good food supply for winter birds. Moving feeders to a sheltered area will make it more convenient for refilling as well, and be sure all feeders are clean and in good repair for fall and winter birds. Prepare Winter Shelter: A safe, comfortable place sheltered from wind and snow will help birds survive winter storms. Roosting boxes are ideal, but not all birds will huddle in cavities on cold nights. Building a brush pile will provide instant shelter for many types of birds, and planting evergreen trees and shrubs will ensure ongoing shelter for them to use. Winterize Bird Baths: Birds need water in the winter just as much as they need food and shelter, and switching to a heated bird bath or adding an outdoor, appropriate heater to an existing bath in fall will ensure there is plenty of liquid water for drinking. Be sure the bath is in a level place where it will be easy to refill as needed. Prevent Window Collisions: Millions of migrating birds are killed each year by colliding with windows. Help birds see windows better by partially closing curtains or blinds, add frosted decals to the glass, or hang ribbons or other objects in front of the glass. Position feeders and baths either closer than three feet or further than 10 feet away from the glass so birds can more easily avoid the glass. Leave Leaves Alone: Don't break your back raking leaves in the fall. While it's good to get big piles off the lawn, leave some leaf litter in garden areas and under shrubbery so birds can seek out the insects and seeds among the leaves. The leaves will also add another layer of insulation to brush piles and other shelter birds use in winter. Even as birds are getting ready for winter, backyard birders can get ready to help. 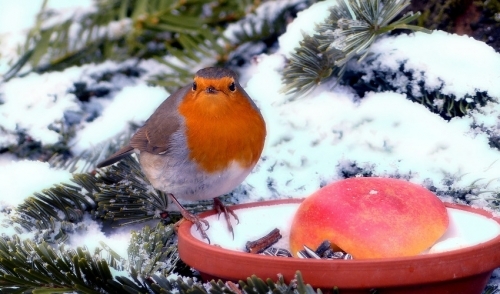 With a few simple steps, you can make your yard useful to birds no matter how cold and snowy it may get, and you'll have birdy company all year round.